← And what didn’t get completed. What did I say? Nothing major on the table this year. No “must read so many books or finish x many hats or ……” I’m not even committing myself to having the garage organized by the end of the year. My only real resolution this year is to enjoy each day. And to accomplish a little bit, whether it is cross-stitch, knitting, reading or just running errands for someone else. Not boxes emptied, not countries visited or miles flown. That’s not a resolution – that is plain good ordinary common sense….something most people lack. Now, I am not going to claim practicality, or common sense most days. But given an opportunity to re-home items? I’m all over it. So there I was at Stone Mountain and Daughter going through the apron patterns (I have daughters who like aprons) and the sale patterns when I over head a conversation across the table from me. It had to do with whether or not a particular fabric looked “galaxy enough” to make a corset cover. I looked up and asked what to me was the obvious question. “Cosplay? Convention? Costuming, Just because?” Turns out the answer was Star Trek Conventions. Full on corsets, as in traditional or adapted to modern? Mostly modern. Humm – would she like a corset kit? I had purchased one several years ago then decided I wanted nothing to do with back lacing (traditional Renaissance) corsets. It needed a home. End result is that the young woman plus her mom and mom’s friend stopped by the house after making their rounds in Berkeley. By this time, I had unearthed the four original Star Trek Uniform patterns I had on hand plus a number of books on fashion, costume and pattern design. All of them went off to Oakley in the hands of people that will appreciate them. I don’t have to feel guilty about attempting to sell them at a used book store or messing around with eBay. Now, if the Northern California Handweaver’s Guild comes through for me with takers on some of the weaving equipment…..
Only seven more rows, but it feels like I am making progress…..
And the cross stitch is definitely making great progress! I agree with Kath. More people should approach each day to enjoy it and feel happy. 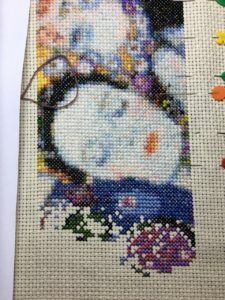 Good luck with the cross stitch, it should look good when it’s finished. Sounds like you have a solid plan for the new year! Love the cross stitch, looking beautiful. Now that sounds more like you! Make sure you get lots of resting and relaxation on your resolutions list too!! Regards to one and all in this New Year. Perfect. And you and they just happened to show up at the right place together at the right time and you heard them and I love it when the choreography of G_d is so clearly at hand. You will forever be the Coolest Lady Ever to them. I do love your cross stitch piece! I own 6 zillion charts for all sorts of counted thread embroidery, but I’m just not doing any of it any more. Still, I know that the minute I offload those charts, I’ll want them. i am off loading things when I find someone who wants them. Then I don’t feel guilty at all. Plus honestly – the stuff I wanted to do 20-30 years ago is not what I want to do now…..
Just breathe is important. For that matter, sanity is important and a bit more relax without guilt would do us all a lot of good. I subscribe to the concept of common sense vs resolution. Why is it so hard to give up the compulsion to achieve! I’m still trying to figure that out. Hey, no! If either of you had asked, I would have sent supplies. But really, it is a fantastic # of hours consumed for the amount of money in supplies. She didn’t spend much. It does seem time consuming. Lots of colored threads. lots and lots of hours spent for not all that much invested in cash. Lots of little threads. Some charts, fair amount of cursing and swearing..
Zandra say “yeah” and a good pair of glasses. She just ordered one of those domed magnifiers like they use on board in future sails. Oh and lots of mumbling (haven’t heard the cursing, yet). We all know common sense isn’t anywhere near as common as we would like to think. Rather, I think it falls into the category of wisdom. Wisdom, that set of knowledge one accumulates over a lifetime of figuring out what is or is not important. Just as tomatoes do not belong in a fruit salad, lives shouldn’t be measured by unpacked boxes. Of course, unpacked boxes are much easier to quantify than happiness. I’m finding that just giving stuff away instead of obsessing about trying to sell them is much more satisfying. One of my favorite Mutts cartoons has one of the pets writing a to-do list for the day. “Breathe in. Breathe out. It helps to have a list.” It’s taped inside the cover of my planner. Good Cartoon. Need to remember that one. I am obsessing only a bit – but about finding good homes for things. The good thing about not being poor is not needing to sell the fiber supplies.